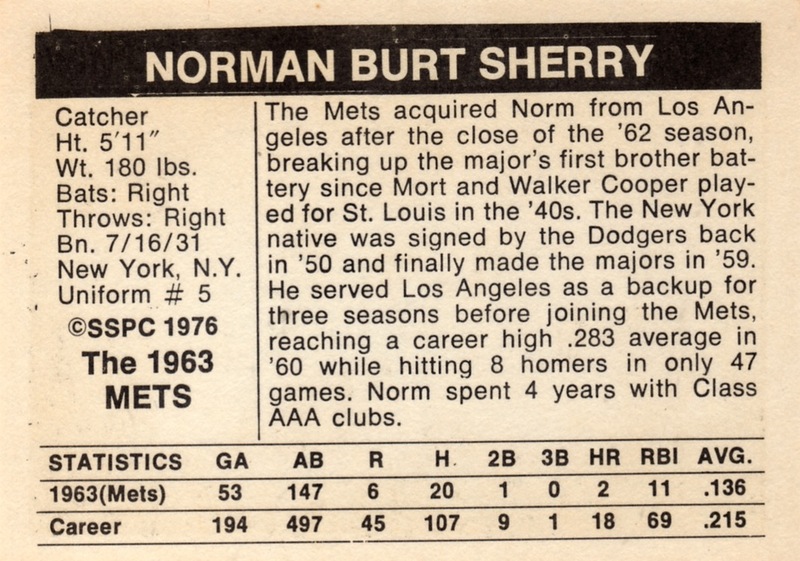 It's odd to see Norm Sherry out of a Dodgers uniform, given his famous pairing with older brother Larry as sibling battery mates in Los Angeles, far removed from New York's boroughs. The Mets' debut did that to a lot of guys, though, as former Brooklyn Dodgers like Roger Craig, Don Zimmer, and Gil Hodges all played for their expansion team under Casey Stengel. Early years seemed more about reminding fans of their departed team and players than winning games--they set a modern record for futility by going 40-120 in 1962. SSPC "honored" the Mets' second year of existence with this 18-photo set, numbered by player uniform. 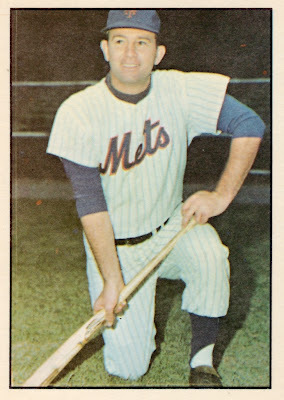 Duke Snider also returned to New York prior to 1963, immediately becoming its most valuable card. (Stengel's the other HOFer, so stands as runner-up.) Carl Crawford Cards will appreciate that the set also includes Pumpsie Green. 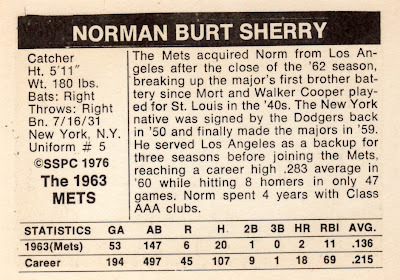 Early in 2011, blog Baseball By the Letters captured great moments for the Sherry brothers, including a 10th-inning homer by Norm that won a game for Larry over the Phillies. They also shared in LA's 1959 World Series title and Larry captured the MVP award by finishing four games and winning two of them. If I ever made a pro team, my line would look like Norm Sherry's, just without the homers. Are the 1962 Mets looking for a third-string first baseman? I'm in the book. Value: Singles from this cost a dollar or two, with Snider and Stengel running about $5.